Larger machine made bowl produces a rich sound for its size the gift set contains a machine made brass singing bowl, wooden striker, and simple cushion all presented in an elegant handmade himalayan Lokta paper box, printed with a very brief history of the singing bowl, advice on how to play and it suggested uses. Machine made metal bowls are generally easier to play than traditional handbeaten bowls as they are have a smooth polished finish which allows for a steadier movement, this makes them ideal for people learning or for children. Hand beaten bowls have more complex and overtone rich range of sounds but there is more of a knack to playing them than with machine made bowls. Rest the singing bowl in the palm of the hand; hold smaller bowls on the fingertips. Hold the striker in the middle with all fingertips pointing downwards. Gently tap the striker against the side of the bowl to ‘warm it up’. With an even pressure, rub the striker clockwise around the outside rim of the bowl. Use a full arm movement just like stirring a big pan of soup. Try to keep the striker straight and remember to apply pressure. 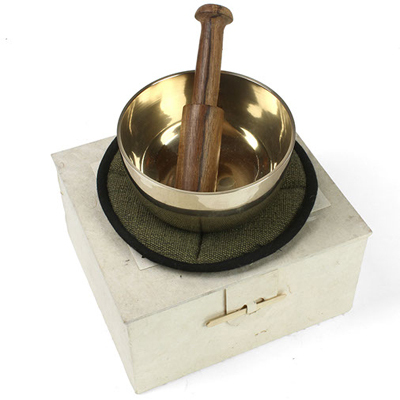 Let the sound build up slowly as the singing bowl picks up the vibration. Excellent for meditation. Makes a lovely gift. Diameter:10.5 cm, Height: 5.5 cm.